Is there a great Image Viewer out there…one that is simple to use and…FREE? I believe there is…it’s called Fast Stone Image Viewer. I have tried many image viewers and photo organization software and found only a few decent ones. Out of all the ones I have tried, FastStone Image Viewer is really the best! This article outlines the features of this great program. Well, you find these in just about any image viewer and yes it’s true…however, this program is very fast and very simple to use…just check it out. Very, very, very fast ! As simple as that. No need to import folders. You just open your folder structure and you see your pictures. Image editing functions available in image full view. This makes for very fast editing. Image resizing and cropping tool is very precise. Very easy to crop and re size to precise measurements. Bulk resizing of images available via the Email function. Great support for e-mailing pictures. Not only via email client but also as compressed images that can easily be attached to an email. The only real con is image quality. Some darker pictures appear to be noisy even though in other image viewers they look great. Bulk resizing available only via the email functions. It took me a while to figure out where bulk resizing was. I thought it wasn’t available…until I tried the Email function. Tagging feature is confusing. Fast Stone Image viewer does not support adding image keywords. The tagging feature is more like selecting favorite pictures by checking a check box in each thumbnail image. There is not tag list or tag “cloud”. FastStone does not support IPTC or XMP. This is the best Image Viewer I have been using. I recommend it without any reservations. Try it out for yourself, you won’t regret it and…it won’t cost you a dime. This program is not equivalent to Photoshop and its image editing functions are very simple. However, this program is intended to be a fast and simple Image Viewer and it excels at that? What image viewer are you using? 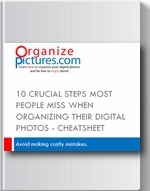 I am always interested in finding out what software you are using to organize, view and edit your pictures. So, please add a comment and share your own experience. Thanx Kelley again for your comments. Yes, if you’re looking to be able to add keywords/tags to your pictures, FastStone ImageViewer is not the right product. There is no metadata database that is created with ImageViewer…that’s probably why it’s so fast. If you need tagging…try XnView (free), ACDSee, or Lightroom. Ok, I tried it. I love the workspace view it is pleasant and there are some great basic features. I can’t use this because I need a specific Tag/Keyword feature and I would really love it if the image info…metadata was dockable or in a sidebar. This is fast and if you don’t mind the two things I mentioned, I agree it is a great free image viewer. Thanx Kelley for your comment. Yes, PSE is a great program but it loads the entire picture editor program which is bulky and slow. I use PSE but only for editing my pictures. I like FastStone Image Viewer because it is very fast…comes up fast and navigation is very fast as well. It has some new editing features as well that I like. I use the Organizer that comes with Photoshop Elements. It is actually on the professional level. I am always searching for that one software that has it all and the PSE 6 or 7 is great but loads the full PSE program if formats are associated and that takes too much time sometimes. I also like Windows Live Photo Gallery. It is lighter and if the metadata was in the same screen as the photo, it would be my favorite.